Generally, good planning can yield positive results since not much is left to chance. Well, sometimes plans change and at times, they never come to fruition. 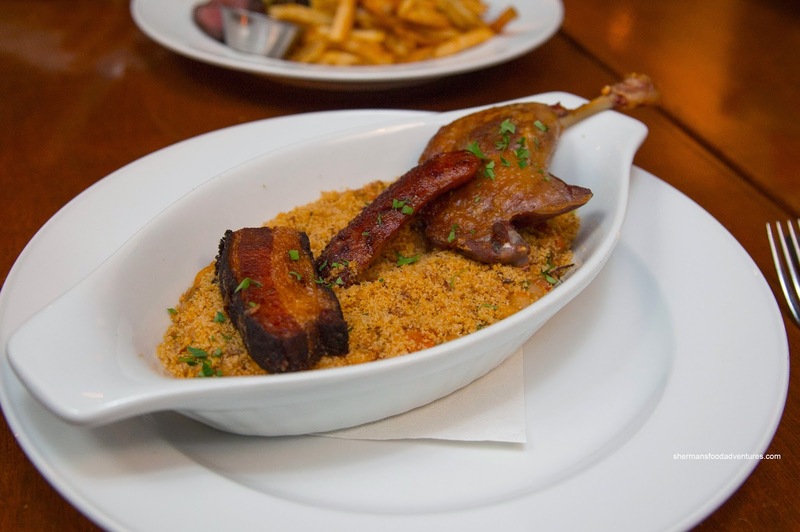 This, my friends, is the story of how we nearly ate at Bistro Wagon Rouge. 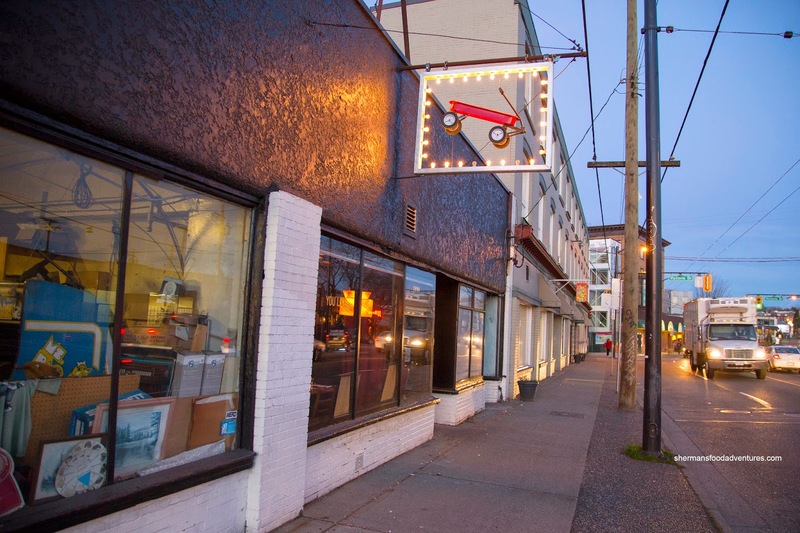 It was first mentioned way back when we were dining at Ask for Luigi... in April 2014. Yah, after several setbacks, we were determined to eat there once and for all. Even a last minute cancellation from Miss Y (she was sick... at least we wouldn't be ordering the least desirable dish on the menu...) didn't deter us from finally climbing our Everest. Ned Flanders, Whipping Girl and I did the impossible - plan to eat at BWR and get a table (albeit right at 5:00pm). 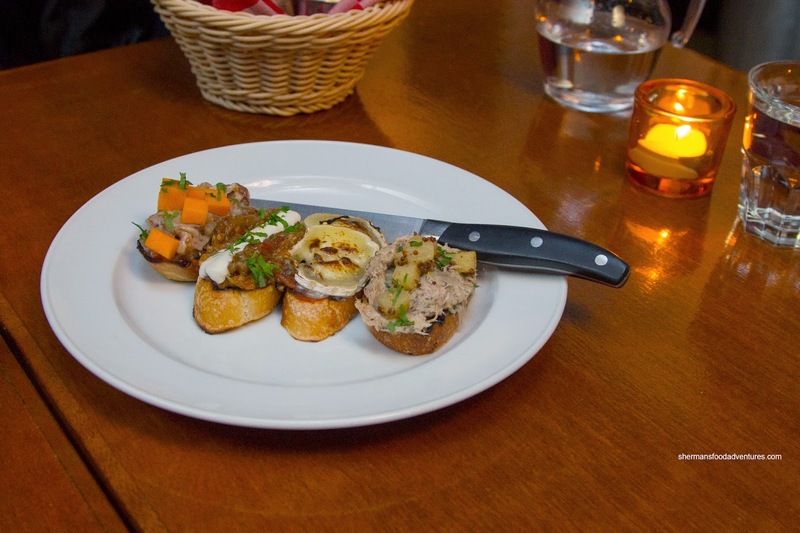 After perusing both the regular menu and the daily features, we decided to share some appies including the Tartines (from left-to-right: Duck Fat, Charred Eggplant, Tomato & Goat Cheese and Pork Rillette). Rich, salty and ultimately "ducky" the first tartine benefited from the crunch of the pickles underneath. There was a notable smokiness to the tender charred eggplant that lingered. I thought the tomato and goat cheese was okay, but was probably the least impactful of the 4. As for the pork rillette, it was meaty, creamy and just salty enough. 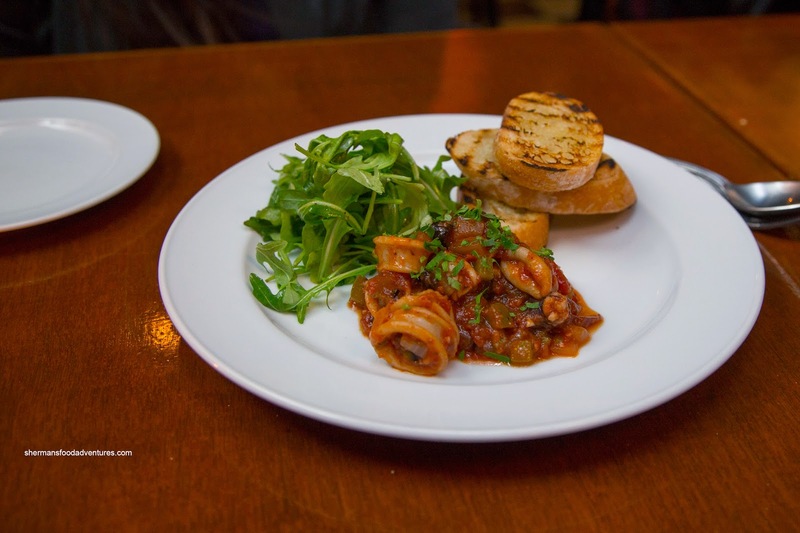 Next, we tried the Squid Ragout. This reminded us of a antipasto with tender squid mixed in. Hence, the flavours were familiar with the tang of tomato, sweetness of the onions and the sharp saltiness of the olives. As with the tartines, the crostinis were expertly grilled until crunchy and a touch smoky. 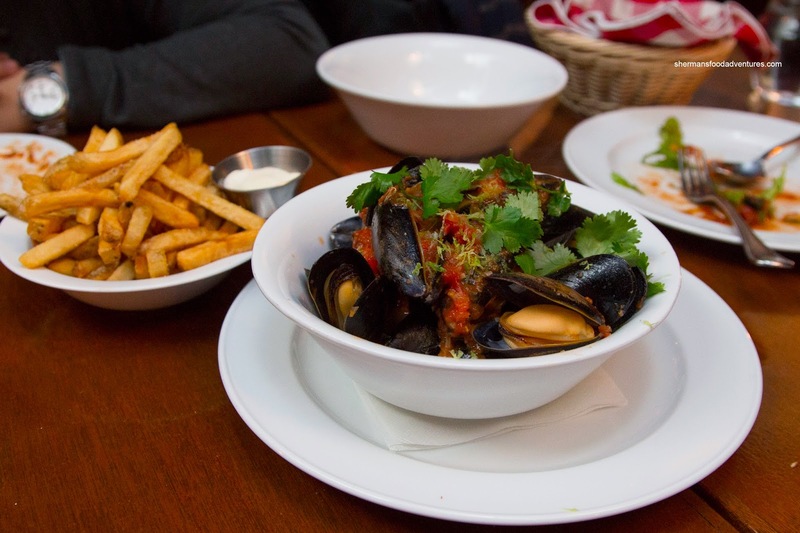 Since Whipping Girl wanted it all, she thought it would be a good idea to split the Moules et Frites as another appie (so she could order another dish as her main). This version was bathed in a broth consisting of white wine, fresh tomatoes, lemongrass, shallots and chili. We found the wine essence to be quite strong and with the help of the tangy tomatoes obscured some of the lemongrass flavour. However, when we dipped some bread into the broth, it was all there including the very slight amount of chilis. As for the mussels, they were plump and buttery. 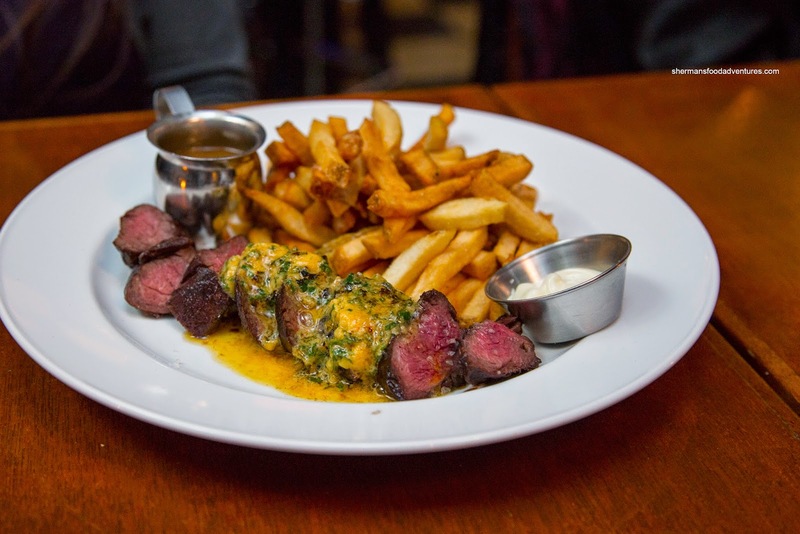 Now that she had her mussel fix, Whipping Girl proceeded onto her main being the Steak Frites with herb butter and peppercorn sauce on the side. The hanger steak was beautifully medium rare and tender. As much as we liked the butter, it was a tad salty while the peppercorn sauce had just enough bite. We enjoyed the frites as they were lightly crispy while retaining a potato texture. 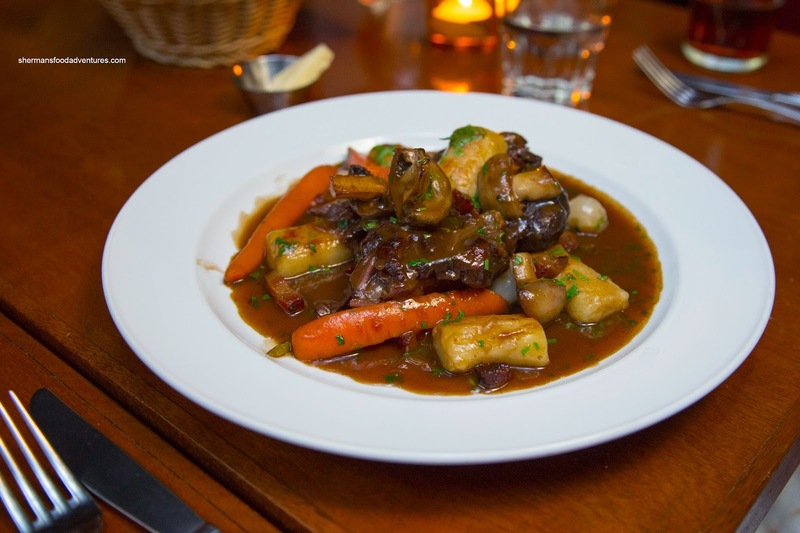 Ned Flanders had the Beef Cheek Bourguignon with gnocchi that arrived as a pretty large portion. So much so, he didn't finish it! Gasp! Where is Mijune when you need her? Despite not finishing, it was still very good. The rich gelatinous beef cheek was melt-in-our-mouths tender while the gnocchi was a bit too soft. We found the sauce to be silky and full of depth in terms of meat flavour and proper seasoning (as the sweetness from the veggies). For myself, I went for the Cassoulet with pork belly, sausage and duck leg confit atop haricot beans. I found the duck leg to be excellent with properly render skin which was appealingly crisp. Underneath, most of the meat was soft and plenty salty. Reminiscent of Red Wagon, the pork belly was crisp on the outside while being soft and fatty. Although topped with texturally contrasting toasted crumbs, the beans themselves were a bit too soft. 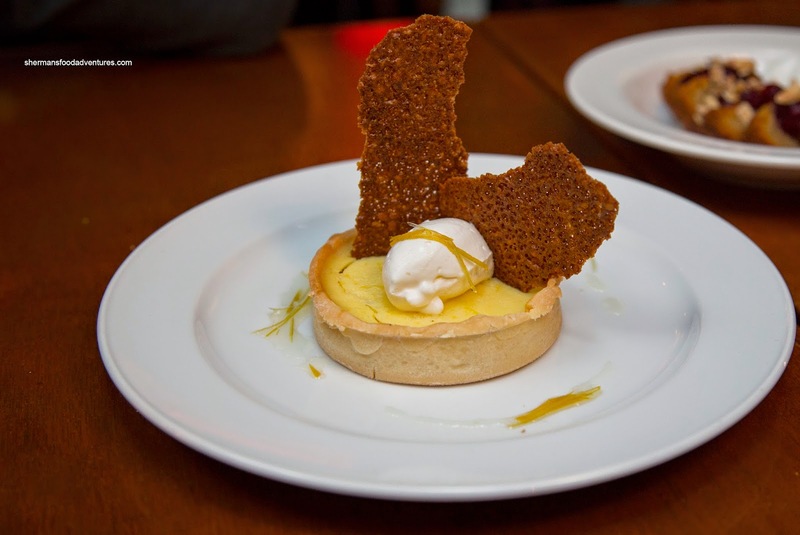 For dessert, we weren't that impressed with the Lemon Tart as the shell was both not aesthetically-pleasing nor texturally on point. It was firm on the top edge, yet the rest of it was soft and almost soggy, especially on the bottom. As for the curd, it was definitely sweet with some tang from the lemon. On the other hand, it was missing the necessary essence from the natural oils. We surmised that it may have been sitting around too long in the cooler. However, the Brown Butter Almond Financier Cake made up for it as it featured a wonderfully light crunchy shell which encased a buttery interior. 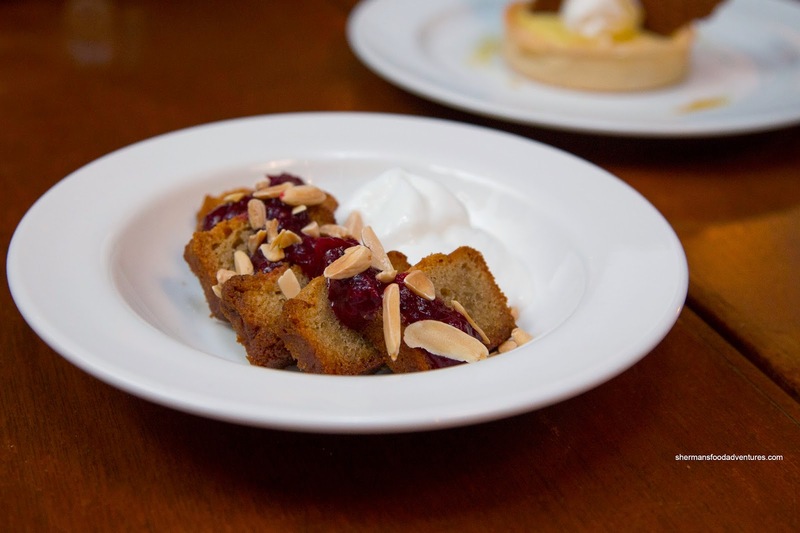 The cranberry compote added the necessary brightness and tart hit to break up the butteriness. So after nearly a year-long quest to eat here, was it worth the wait? Well, we didn't regret eating at Bistro Wagon Rouge as most of the dishes were good and well-portioned. If we had to compare to a similar meal we all had together, we thought that Absinthe on Commercial would give BWR a real run for its money.